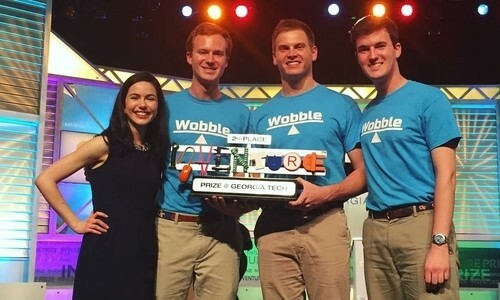 The Atlanta Clinical & Translational Science Institute (ACTSI)-supported team of Georgia Institute of Technology (Georgia Tech) students placed second in the InVenture Prize Competition with their medical/health/therapy device called Wobble. The dynamic balance testing device can be used to assess concussion recovery in athletes, and in predicting risk of falls in older adults. Team Wobble, made up of Hailey Brown, a mechanical engineering major from Atlanta, GA; Matthew Devlin, a biomedical engineering major from San Diego, CA; Ana Gomez del Campo, a biomedical engineering major from Weston, FL; and Garrett Wallace, a biomedical engineering major from Sutter, CA, was supported through ACTSI’s Research Technologies program support of Georgia Tech’s Capstone Design Program. This support enabled the team to develop the prototype showcased during the InVenture Prize competition. The InVenture Prize Competition at Georgia Tech challenges undergraduate students and recent graduates to develop and present an invention which is judged by a panel of experts. Six finalists are then selected to advance to the final round televised on Georgia Public Broadcasting. The first place team receives a cash prize of $20,000 and the second place team receives $10,000. The top two teams also receive a free U.S. patent filing by Georgia Tech's Office of Technology Licensing. The Capstone Design Program is supported by ACTSI and administered by Georgia Tech. It consists of a series of courses offered to undergraduate students from all disciplines at Georgia Tech. Students work in teams to design, build, and test prototypes with real world applications. The Capstone Design courses provide students the opportunity to work with real-world, open-ended, interdisciplinary challenges proposed by industrial and research project sponsors. The students learn and apply the engineering design process: defining functional requirements, conceptualization, analysis, identifying risks and countermeasures, selection, and physical prototyping. During the semester teams participate in the Georgia Tech InVenture Prize and at the end of the semester, student teams participate in the Georgia Tech Capstone Design Expo. The ACTSI is a city-wide partnership between Emory University, Morehouse School of Medicine, and Georgia Tech and is one of over 60 in a national consortium striving to improve the way biomedical research is conducted across the country. The consortium, funded through the National Center for Advancing Translational Sciences (NCATS) and the National Institutes of Health’s Clinical and Translational Science Awards, shares a common vision to translate laboratory discoveries into treatments for patients, engage communities in clinical research efforts, and train the next generation of clinical investigators.